The first commercial microprocessor, the Intel 4004, was developed specifically for Busicom Corporation for use in its calculators. 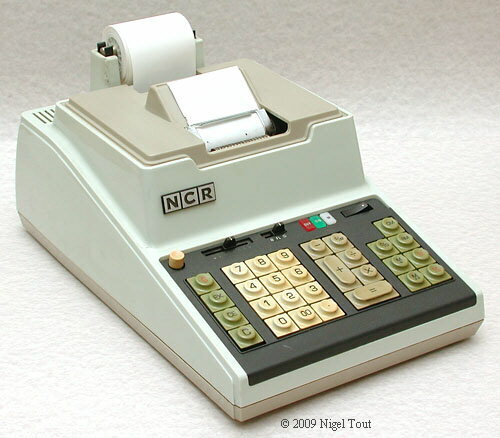 The Busicom 141-PF, sold also as the NCR 18-36, was the first product sold to incorporate a microprocessor, in fact to have "Intel Inside", as the advertising slogan goes. Printout is 15 digits, using a Shinshu Seiki (later to become Epson) type 102 line printer. The line printer has all the numbers required in all the printing columns in raised type around a constantly rotating drum just behind the paper tape. An accurately synchronised hammer for each column strikes the ribbon against the paper onto the type at the correct time, and so a complete line of numbers of the calculation being performed is printed in one go. 4 off 4001, 2048-bit metal-mask-programmable read-only memory (ROM) with a 4-bit programmable I/O port. 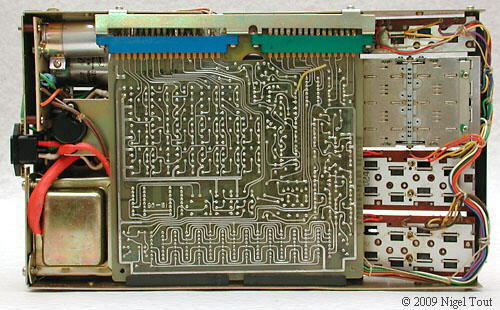 This ROM was only mask programmable during manufacture, and was organised as 256 x 8-bit words. 2 off 4002, 320-bit random-access memory (RAM) and 4-bit output port. 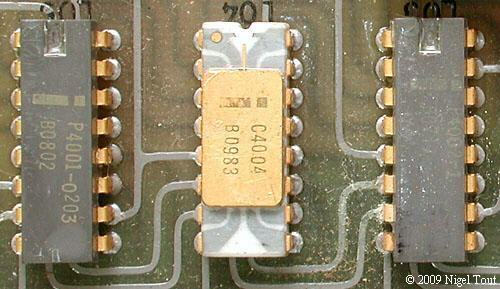 1 off 4004, 4-bit central processing unit (CPU) (the microprocessor) with a maximum clock speed of 750 kHz. 215 x 335 x 155 mm (8.5 x 13.2 x 6.1"). Made in Japan, by Busicom Corporation. Many Busicom calculators were rebadged by the National Cash Register Company of , U.S.A., and sold under the NCR badge. On this site see also the NCR 18-15 and NCR 18-16. The label on the rear of the NCR 18-16, showing it as being made in Japan (actually by Busicom Corporation). The keyboard has a standard calculator layout. With the cover removed. At the rear is the power supply, with the Shinshu Seiki type 102 line printer in front. The electronics circuit board is in the chassis underneath the printer. Removing the bottom covers reveals the single circuit board. 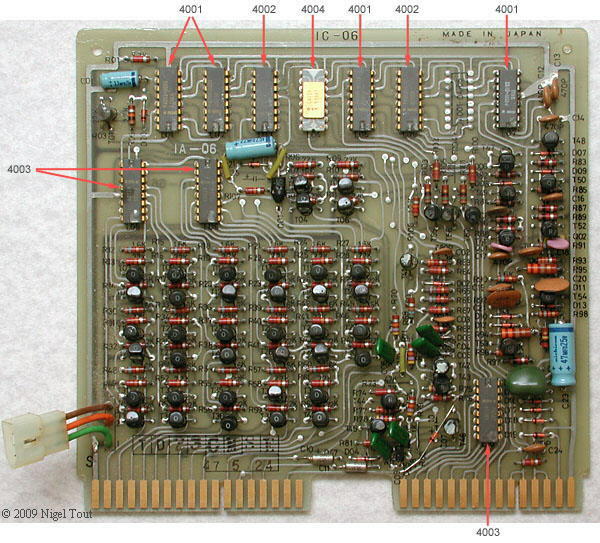 The circuit board, showing the Intel 4004 microprocessor and associated integrated circuits. The black devices with an 'O' or 'R' on top are single transistors. For the first time in history, the classic integrated circuit microprocessor line up: from left to right ROM (4001), microprocessor (4004), RAM (4002). 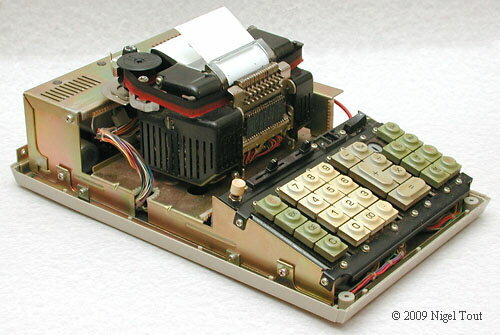 The development for this calculator of the Intel 4004 microprocessor was one of the greatest technological advances of all time, leading on to the Intel 8086, 80386, and Pentium and the ubiquitous Personal Computer. However, in the development of the calculator use of a microprocessor was a dead end due to the simultaneous perfecting of the "calculator on a chip" by Mostek, which dramatically reduced the electronics and the cost of calculators, see the Busicom Junior/NCR 18-16 on this site. Ironically, it was also Busicom which financed this development. The fascinating story of the development of the Intel 4004 is told in on this site in "The Calculator that spawned the Microprocessor". The use of microprocessors in simple calculators was not economic, though Texas Instruments TMS1000 series microprocessors had some use in more sophisticated models. One example from about 1980 is the Sporting Life "Super Settler Mk II" which justified the use of a microprocessor because it was a very specialised calculator produced in small quantities for use in betting shops. By then it was cheaper to use a cheap microprocessor for the small production run rather than have dedicated calculator integrated circuits manufactured. Busicom was one of the most technologically adventurous calculator manufacturers, bringing to market the first pocket-size calculator, the Busicom LE-120A "Handy", which was also the first calculator with LED display. 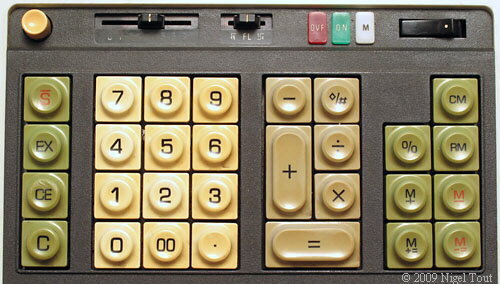 However, with the dramatic reduction in the cost of calculators it got into financial difficulties and ceased production in 1974, though the name was bought by a distributor and continues on calculators to this day.